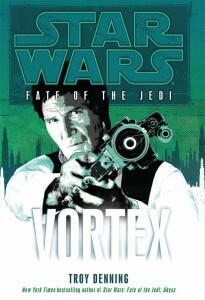 Vortex, the sixth book of the nine-part Fate of the Jedi series, is now in bookstores. After a below-par Allston entry for book four and a poorly written and improperly edited fifth book from Golden, fans had every right to be concerned about what’s next in a series which obligates readers to a two-plus-year commitment and a considerable financial outlay at hardcover prices. Troy Denning, therefore, has a large burden thrust upon his shoulders with this sixth book – to carry this series back to a place where fans will want to re-engage. First-week sales for Vortex garnered only a #20 ranking on the New York Times Bestsellers List, a remarkably low start for a Star Wars EU flagship series book. While holiday sales of other popular books would be expected to impact its place on the list, I’d suspect that we’re also witnessing the effect of initial wariness by fans in making future investments into the FotJ series. 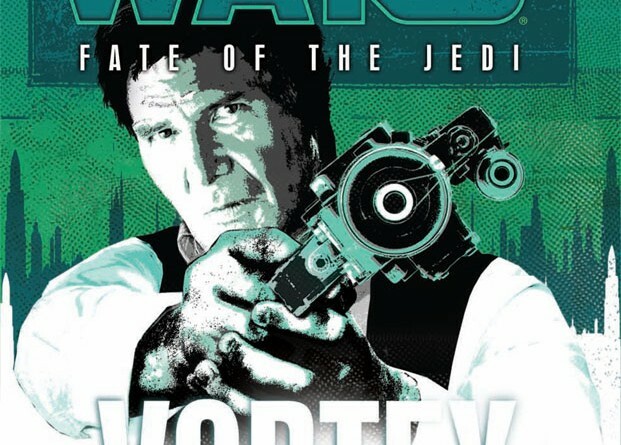 First Impressions – The image of Han Solo brandishing a blaster is one of the more appealing cover images for the series. The backside artwork of Jedi Master Kenth Hamner, on the other hand, was disappointing. The overall color and design is underwhelming for bookshelf and online thumbnail display amidst all the seasonal green and red hype. I consider also quality control of the product a part of presentation to the customer. Typos are minimal and for most readers will be imperceptible. Writing Craft – I cannot say enough good things about Troy Denning’s writing capabilities. For those who want to learn how to write well at the technical level, this is a must-read book. Some of the more difficult elements of writing appear easy when crafted by Denning. Dialogue is clean and simple to follow. Universe-shifting peril is served with a dose of mischief and fun. The use of point of view (POV) in Denning’s books remains top-notch. Denning weaves a story of unreliable narrators; what a character perceives or expresses is not always what has truly happened. It is slights of perspective that conceal the truth of Denning’s story, because it is what the characters do and not what they say – or tell the reader – that ultimately matters. In other words, the book practically defines the expression déjà vu. So while it’s true that Vortex does a far better job of progressing plotlines, the trouble is that many of them are simply repackaged “developments” from earlier books in the series. As a fan and critical reader, it’s been very apparent that the upfront series planning was very limited. The design almost ensures that unless a customer is already reading Fate of the Jedi, they won’t be purchasing this book. Characters – Great characters need motivation, and throughout this book the reader sees motivations for each character’s choices – a refreshing change from the last FotJ book, which relied heavily on the plot to drive the characters actions. The book covers have resisted aging the Big Three, but if a casual fan were to open Vortex, Luke, Leia, and Han would be almost unrecognizable, so far have their personalities shifted from their core character traits on the big screen. Many dark events and tragedies have erased much of Luke’s optimistic compassion and replaced it with a cold, calculating, jaded widower and exiled Jedi Grand Master. He’s working with Sith – many Sith, in fact – and that is a long stretch of an imagination for anyone who’s just come to the Star Wars EU. For those who do understand how the events of the last two-and-a-half series have brought Luke Skywalker to this point, the tentative alliance has still been hard to buy into. The villian Abeloth is an entity beyond our comprehension, or at least that’s how she was explained. The presumption apparently is that if the characters, through whose POV we see the story, can’t wrap their heads around what this entity is, then the reader doesn’t need to either. For a story that works very hard to define every character’s motivation, Abeloth’s inscrutable nature is most likely a deliberate choice. But it’s certainly not one that’s shaping her up to be a memorable EU villain. Moreover, although character motivations were usually made clear, there are too many odd rationalizations that were troubling as a reader. 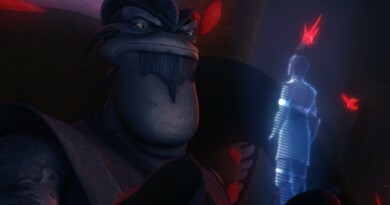 Jaina Solo, Allana Solo, Saba Sebatyne, and Kenth Hamner – EU fan favorites suffer from disconnected storytelling decisions. Wynn Dorvan, an existing EU character who’s been fleshed out in this series, has been written inconsistently, alternately conniving and altruistic between one book and the next. The best moment in the book comes when Denning simply relies on a tried-and-true Star Wars character to act as fans would expect him to. Booster Terrik’s laugh-out-loud hostage-taking is spot on in its utterly senseless, campy, fun quality. It’s Star Wars boiled down to the essentials – if all else fails, blow things up. Star Wars – As a flagship series, Fate of the Jedi needs to remain true to elements that have drawn fans into Star Wars: good versus evil, Jedi, Sith, lightsaber battles, space battles, droids, annoying creature sidekicks, and most importantly hope. This book has Jedi, of course, although not always recognizable in the more grey-shaded Legacy era that has been spun out of the recent EU. There are Sith; Sith pirates, even. Lightsaber battles, with limbs hacked off for good measure. Space battles, silly droids, and creature sidekicks too – it would seem Denning has hit most of the marks, and for some, those pieces strung together in a book will be good enough. The trouble lies in that this series seems to be trying to be more than a Star Wars story. It wants to be part romance novel, conspiracy mystery, murder trial thriller, angst-ridden teenage melodrama, and historical fiction. The tropes of the first three types require that the stories work within the conceit of the genre, all of which require resolution to some satisfaction for the reader within a single book: a happy ending, solving the mystery, acquitting the wrongfully accused. The latter two styles – teenage melodrama and historical fiction – are more adaptable to series writing, but they fall flat in FotJ. The slavery plotline that has emerged in the last couple of books appeared after reader complaints of overly slender books being offered at a steep price. It has provided some exceptional scenes, including Madhi Vaandt’s death, which I couldn’t put down. I suspect it’s also meant to have tie-backs to the Imperial conspiracy and Freedom Flight, but the creative team doesn’t seem to grasp that the time span between books is so far apart that the nuances get completely lost. Ben and Vestara were slotted into the coming-of-age plotline, perhaps as a way to try to capture a new teenage audience, but it’s quickly become tiresome. Star Wars has always been a love story, love of friends and family as well as romantic love. It is love, and more importantly compassionate love, that drives the Original Trilogy forward, that makes us care for Luke and his friends on their quest. So it’s worth asking, who exactly is Ben fighting for? His father? That’s admirable, but is it enough? Ben wants to save the galaxy, but he hasn’t truly existed in it. Personally I think Ben’s growth would have been better served in a Young Jedi Knights style series that was a little less dark. This would have allowed the EU to grow a cast of characters they are so desperately in need of as the Legacy era books empties its own sandbox. It is my opinion as a woman that the flagship series still has a way to go to achieve gender equality, both in representing female characters and in telling stories women want to read. As a writer, fan, and reader, I understand that good characters are flawed and that bad things happen to people of both genders. Women don’t expect or need female characters to be treated differently than their male counterparts; but we do expect for them to be treated equally. The trouble with the storytelling thus far in FotJ is the balance. The portrayal of female characters in the aggregate is far weaker. Vortex hasn’t come far enough from the lows of Allies. 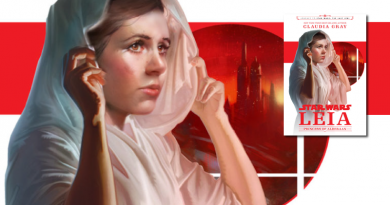 The people guiding Star Wars books need to sit down and consider if they’re bringing enough to the table for the female fans, who are proving to be a worthy share of the market. Shortsightedness has brought the EU to the point where it is, and it will require some careful character arc mapping and skilled execution to dig the Legacy era out of the character void it has created. Bottom Line – Fans of Star Wars understand that space opera requires tragedy to befall our heroes, dark hours before the dawn of hope, and the conceit of handwaving some plot elements to move the story along. The reason Star Wars has been imbued into our collective consciousness is that its heroes are grandiose and archetypal. 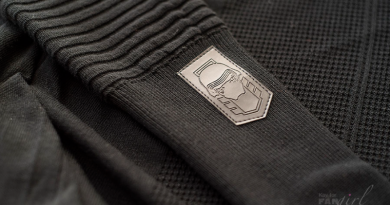 Denning loves to explore the greyer shades of the saga, and this is exactly what you’ll read in Vortex, when really what the Star Wars EU needs to do is go back for a while to being black and white. This isn’t a book to jump into the EU, but if you’ve invested so far you might consider picking this one up, if for no other reason than it appears Denning has set Allston up for some classic Star Wars mayhem. As a long-time reader of Star Wars books, I can certainly understand and empathize with anyone who would rather wait and see. On a brownie sundae scale, Vortex was created by a master chef and served in what has generally been considered a finer dining establishment, but it was made with stale ingredients, Cool Whip instead of real cream, and it’s missing the nuts and cherry on top. To much gray. That’s the last thing I want to hear after the mess that was Allies. I thought Kenth was being Abeloth-influenced, myself. The raving paranoia was characteristic, and we see from Valin and Jysella that Abeloth’s gotten more cunning about her paranoia-induction. Thank you, thank you, THANK YOU. I really, truly want to like Allana, but I cannot. She acts spoiled rather than independent, arrogant rather than intelligent, and Too Stupid To Live (to borrow a term from romance novel fans) rather than childishly naive. Maybe that’s a bit harsh, but as I said, she’s a big letdown. I definitely agree with you about the female characters. After a minute or two of thought, I have to wonder if we’d be having half these problems if Luke’s child had been a daughter. (Beru Skywalker?) Assuming the authors wouldn’t have dumbed her down compared to the Ben we have, she could have filled the heroic adolescent-female-character gap that Allana’s currently too young to fill and that Vestara might be barely beginning to fill if she’s going to be redeemed. Of course, the gap wouldn’t be nearly so noticeable if Jaina, Tahiri, and Tenel Ka weren’t being stuffed into, if not the refrigerator, the refresher… To be frank, any hypothetical Beru Skywalker probably would have been sent to hang around the refresher with the previous generation’s female characters, complete with being blinded by a youthful crush on Jacen Solo. Ugh. Brief off-topic question – How do you think the current female-character issue would have turned out if we had Beru rather than Ben? Better, worse, or about the same? Okay, back on-topic – I think the female-character issue began in LOTF, though it was a lot less noticeable then. Tahiri was already being reduced to Jacen Solo’s pawn and later Ben’s redemption class project (though you may disagree, I lay the blame on Denning for finalizing this – Traviss was quite heavy-handed about hammering in the possibility that Tahiri was a lot savvier than Jacen thought she was), Jaina was being bashed over the head with the Sword of the Jedi title and duties at the expense of her own feelings, and Tenel Ka was forced to give up her only child. It only exploded in FOTJ, but the fuse had been lit. …Of course, that’s mostly hindsight, now that I think about it, since the male characters were being mangled just as badly at the time. I considered that possibility for a day or so, then realized I really didn’t like that explanation. Kenth is a Jedi Master, and we have no frame of reference to when he could have been “taken over.” I’m not a big fan of the ‘boogie-monster made me do it’ plot devices. I accept it for the younger Jedi, but not for the Abeloth-madness to just suddenly appear in an otherwise rational and experienced Master. I’m not sure that Beru Skywalker would have changed the dynamic. The post-NJO authors just haven’t been able to produce story arcs that women can relate to. Adding a new female character won’t change that dynamic. It only exploded in FOTJ, but the fuse had been lit. …Of course, that’s mostly hindsight, now that I think about it, since the male characters were being mangled just as badly at the time. I actually think that they did some strong male characters in LotF, but the fuse had certainly been lit for the implosion around the female characters. There is much I could say about the “Dark Man” and the meaning of visions. I’ll save that for another time. I wish they would give Luke a heroic death, just not in FotJ, which has become scattered and rambly. Luke needs a book dedicated simply to his death, not a series. Thanks for taking the time to reply. I loved hearing your thoughts.